The company we’re looking at today on The Next Small Cap has shifted focus away from graphite for now – almost unheard of in the small cap resources space these days – to focus on something altogether more valuable. This company is moving lock-stock into the world of rubies – a speculative commodity which has boomed in recent years thanks to the luxury market in China taking off quicker than a Lear Jet. Playing in one of the best ruby hotspots in the world, this $6 million capped ASX stock acquired the rights to three prospective ruby licences right next door to one of the leaders in its upstream space valued at circa $478 million – an AIM listed company called Gemfields. Gemfields sold 5.98 million carats between 2012 and 2015 for over US$150 million (A$207million), and in that time, its market cap tripled. Our tiny ASX stock has also recruited the same geologist that was instrumental in setting up Gemfields for success. Now he is looking to repeat his success in the early stages of development with our ASX stock. Before we go too far, it should be noted that for political and social reasons, this is a very high risk stock. Getting mining projects up and running in countries such as Mozambique is no simple feat, and there may be challenges ahead. The reason for this company’s change in focus is actually pretty admirable, and smart. This company recognised that developing a graphite play, while completely worthwhile, doesn’t tend to generate a short-term return. Gemstone mining is another story, because as part of the JORC Resource process a company actually needs to sell rubies to satisfy key conditions. That means the company could be bagging revenue a lot sooner in the game than its graphite cousins. The company has done all the geotechnical studies to bring it to a point where it’s ready to start digging up rubies. Near term catalysts abound, with this company set to fire up the drill rig in the coming weeks. It’s ready to enter the bulk sampling phase, and therefore is close to revenue generation right now. A recently completed $3 million placement fully funds this company’s work programme on its ruby project. The company is also undertaking a Share Purchase Plan to provide existing shareholders the opportunity to participate in the company’s growth and the acceleration of the work programme. Eligible shareholders can apply for a maximum of $15,000 worth of shares (375,000 shares), at an issue price of 4 cents to raise $500,000. The company may accept oversubscriptions up to $1.3 million, and the maximum amount which may be raised under the SPP Prospectus is over $1.8 million. In this article we’ll take you through this company’s ruby play, the great things its neighbour is doing, the ruby market in general, and guide you through the next phase in the company’s growth. 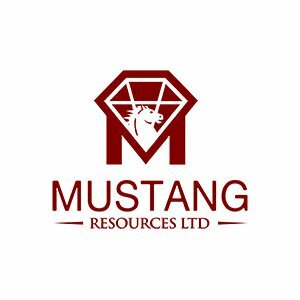 Mustang Resources (ASX:MUS) pivoted earlier this year to focus on rubies, although it has its foot on several commodities in Africa, including graphite and diamonds (we’ll get to the former later). Now though, MUS is moving lock, stock into the ruby game – but why? Regular readers of The Next Small Cap may recognise the Cabo Delgado province of Mozambique as home to a burgeoning graphite revolution – with virtually every man and his West-Perth-based resources company piling in. However, it’s also been home to a revolution which hasn’t necessarily made it into the papers in Australia – a ruby revolution. 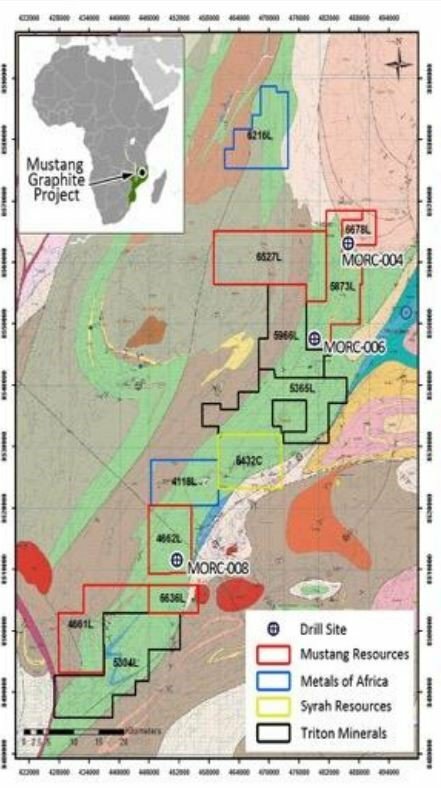 MUS’s slice of the action comes in the form of three licenses covering 158 sq.km in the heart of the Cabo Delgado province, which in turn features the Montepuez Complex – one of the more unique geological features in the world. 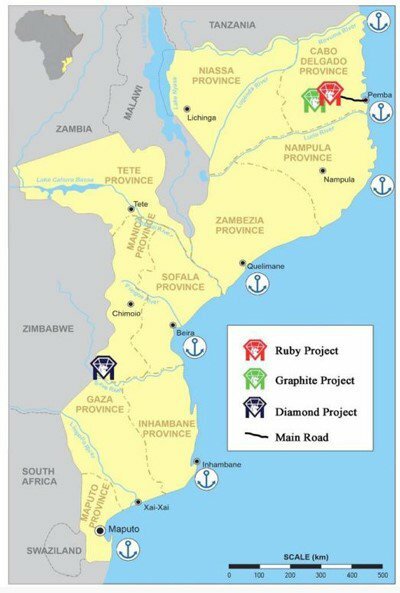 MUS’ permit is in the red zone, and happens to be right along strike from one of the ruby miners shaking up world supply at the moment in the form of the $478 million capped Gemfields PLC Ltd – whose ground is marked in blue. The region is home to artisanal mining, which sees individuals chipping away by hand to try and find rubies in the area. The locals know the rubies are there, but to this point a commercial-scale operation hasn’t been set up. But, back to our first question – why get into rubies when graphite is currently one of the ‘darling’ minerals of the investment community? The answer comes in the form of the way a gemstone project and a graphite project make money for shareholders. With graphite, it’s a bit more conventional with exploration leading to sampling, that sampling being processed to prove it can make a saleable product, designing a flowsheet, doing a PFS and DFS, getting an offtake deal...you know how it goes. With gemstones, however, it’s a bit different. The point where an operation makes money is actually shifted forward quite a bit. The way gemstone mining works is that during the bulk sampling and trenching phases of exploration, it can actually sell its product onto the market. 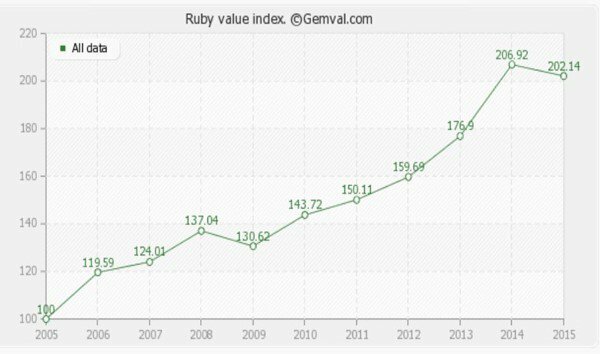 In fact, in order for the company to grab the equivalent of a JORC Resource it can take to the bank for further funding, it actually needs to demonstrate a ruby sale – as a measure of quality control. Therefore generating revenue, often in short and sharp spikes, is a necessary part of the whole process. It means MUS will be generating some kind of revenue a lot more quickly than if it had stuck with graphite as its main game. Let’s not beat around the bush here – one of the reasons why MUS is being featured on Next Small Cap – it has a price of just under 4c per share and a market cap of around $6 million (at the time of writing). To grow, MUS needs to demonstrate revenue generation at a much earlier stage to avoid diluting shareholders or loading up with debt. So, rubies are the go. Based on some of the drilling by its neighbours, there could be grades of up to 300 carats per tonne at play, with secondary mineralisation rates of 7-22 carats per tonne – those aren’t representative of the Montepuez trend as a whole, but rather represent the best known facts to date. The area still requires more work, and MUS believes that higher grade and higher quality sections than Gemfields’ assets can be found. To give you an idea of what that looks like at the market, Gemfields sold 5.98 million carats onto the market in five parcels back in 2012-2015 for over $150 million. So if the overwhelmingly bullish grade estimate holds true, to grab $150 million, MUS would need to mine close to 20,000 tonnes of earth to achieve 5.98 million carats. As we said, incredibly bullish, but if MUS is able to replicate anything like that – then it could be off at the races given it wants to process 600 tonnes of material per day. It just gives you an idea of the sort of revenue and timeframe at play if MUS gets absolutely everything right. As we keep on stressing, however, that’s a hugely bullish back-of-the-envelope estimate and really shouldn’t alone form the basis of an investment decision – professional advice should be sought if considering this stock for your portfolio. MUS is about to enter ‘phase two’ of its plan, having done a lot of groundwork (literally) before this point. What’s it done so far? A desktop study was done in November last year, which involved gathering all the data available on the area and compiling it into a dataset which MUS then used as the baseline for its future work. The field work included a 500m line spacing helicopter mapping survey, looking for those juicy anomalies – the result of which was one primary target and two secondary targets. One of the great things about MUS having an existing diamond project is that it already had key equipment such as a processing plant which is just as applicable to ruby mining as diamond mining. It just needed to mobilise the equipment from its southern diamond play to its northern ruby one. Finally, MUS grabbed a whole bunch of satellite data to help it with its geological model. 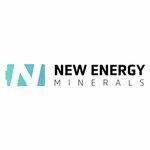 MUS is starting to come into the most exciting time for a small cap resources company, namely, trenching & drilling . A preliminary grid for sampling pits/trenches has been drawn up – based on the work done during phase one of the project. The plan here is to conduct 800m of trenching and 2500m of auger drilling – this has since been pushed back a month to June to make sure everything’s cherry-ripe. Bulk sampling will then be undertaken using a 45 tonne excavator, with the excavator due to strip down between 1-9m. The plan here is to excavate 950 to 1000 tonnes per day to feed 600 tonnes of material per day into the processing plant. This is due towards the back-end of June. Then it will get to work on processing rubies to come up with a marketable parcel of gemstones for the market . Remember, not only does this generate sales for the company, it’s a mandatory part of coming up with a maiden JORC resource. With information from the market about the quality of its rubies and a whole heap of geotechnical data, it will then aim to have a JORC resource in the bag by the second quarter of 2017. After the JORC comes a final investment decision on a full-scale mining play – at this stage it’s looking at the second half of 2017. Just a quick word on these timings... Time slippages are not only common but almost expected in mining, and even more so in a difficult jurisdiction such as Mozambique. We talked before about its neighbour, Gemfields, and to give you an idea of what kind of trajectory MUS could move in we’ll take a look at how Gemfields came to be where it is today and how gemstone miners in particular move. 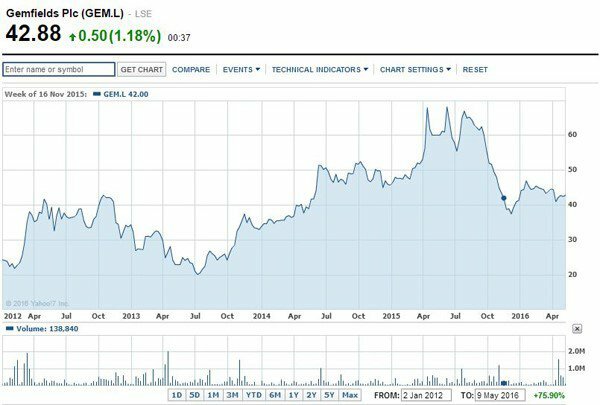 Gemfields PLC (LSE:GEM.L) is a British outfit listed on the London AIM with a market cap of about $460 million – roughly 63 times the size of MUS by market cap . It, however, had much more humble beginnings. It bought into the license right next door to MUS back in 2012 for about US$3 million (A$4.1 million) in cash, taking a 75% stake in the permit area. When it started, the company was valued at 192 million pounds ($A370 million). In June 2014, GEM bagged its first sales – grabbing US$33.5 million on the back of $33 million of investment to that point. The next year it came up with a JORC resource at 62.3 carats per tonne, outlining a project with an internal rate of return of 312% & post tax NPV of approx. US$1billion. In December last year GEM sold another package of rubies, netting US$28.8 million for 90,642 carats bringing total proceeds to US$150.8million. Remember, it invested US$55 million into exploration and production to that point, and raised US$61.8 million – meaning it’s not actually in production yet and it’s paid back its investment. It’s now currently on the path to full-scale production – offering an insight into what MUS may go through. The circumstances are different, and we’re pretty sure MUS won’t be spending US$55 million in the near term, but the trajectory is there to see. Instead of pouring money into the venture and only going cash positive on the project years into production – a gem miner can achieve cash flow positivity before the project is even up and running . 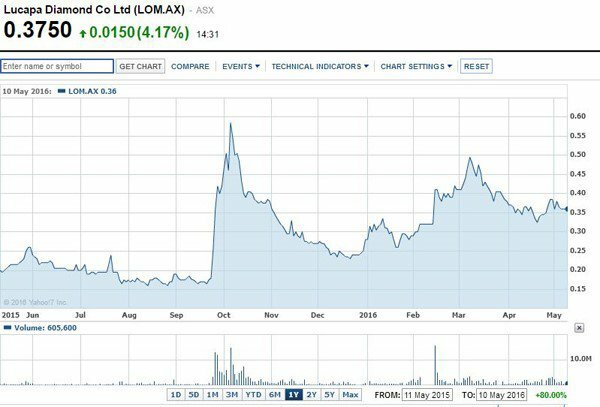 LOM is a less established company than the likes of Gemfields, being an ASX-listed small cap. While it doesn’t deal in rubies, it deals with diamonds in Angola – which has a similar kind of commercialisation route than rubies. Diamonds too are sold in packages before main project start-up as part of the JORC process. Along the way it sold parcels of diamonds for millions of dollars at a time, generating cashflow for the company – but the market moved on news in the back-end of September last year that it had discovered two 50 carat plus diamonds , and even a 90.3 carat diamond . Again, LOM and MUS are two different companies looking for different things on different parts of the continent – but it demonstrates the kind of market support a player can generate on big carat discoveries. There’s no guarantee that MUS will find big carat discoveries, but based on the experience of the neighbours next door there’s a good a shot as a company’s going to get. There’s an old saying in mining circles – don’t trust anybody in a suit. That basically means as good as an executive team may be, it’s the guys who don’t wear suits into the office each day who actually create the most value for the company. We’re talking about people like chief geologists, whose fanciest suit is the one they wore on their birthday (literally and figuratively). They’re the ones who are getting their hands dirty and diving into the data while the executives are swanning about trying to do corporate deals. Not that corporate deals aren’t useful, but getting the rocks right is really the most important part. In this respect, MUS has picked up a gem – in fact, it’s picked up a bloke who’s intimately familiar with rubies at Montepuez. He’s familiar because he was a geologist who played a key role in setting up Gemfields’ project from 2012 to 2014. So, MUS has gained one of the masterminds behind Gemfields’ success in the area and is now looking for him to repeat the trick right next door. Meanwhile, MUS has also brought on another guru into the fold, with Dr John Bristow signing on as a consultant. This is a bloke with 32 years of experience in the mining industry, specialising in diamonds and gemstones in southern Africa. He’s a ‘competent person’ for JORC Code purposes, and between 1983 and 1994 was the head of De Beers Group’s Kimberlite and Diamond Research Unit. Meanwhile, he’s also been CEO and technical director of several TSX-V, AIM, and ASX listed companies such as Rockwell Diamonds, GEM Diamond Mining Corp, Kalahari Diamond Resources PLC and Oropa Limited. Then, of course, there’s the managing director of the whole operation in Christiaan Jordaan – who’s the co-founder of Regius Exploration , a company which has been exploring in Mozambique since 2004. Christiaan is a guy who knows the lay of the land in the country, which is often as important as geology when it comes to mining in Africa. He also holds about 15% of the share registry – meaning he well and truly has skin in the game. Apart from the revenue profile being more amenable to smaller companies, what’s the use of getting into the ruby trade when it has, say, graphite to work on as well? Undoubtedly graphite is a hottest of hot commodities right now, but the ruby market is crying out for some kind of supply disruption to shake up a spotty and fragmented playing field – and the demand side has been kind over the past few years. 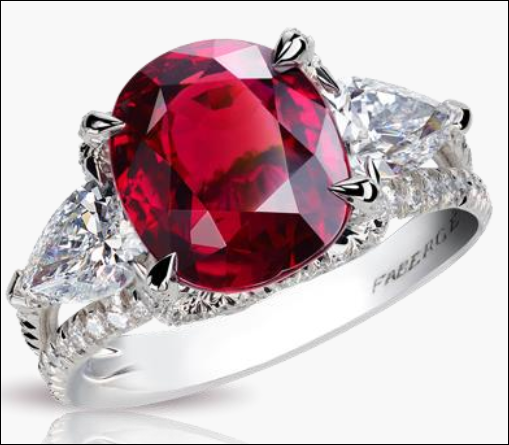 The traditional buyers of rubies have been the United States and Asia followed by Europe. The problem is, with the United States in particular, is that there are trade sanctions in place not allowing rubies from the key suppliers in the world to make it to the market. The highest producers of rubies include Myanmar, Pakistan, and Afghanistan...not exactly the easiest nations to set up supply lines for. In the case of Myanmar, the biggest producer of rubies in the world, the United States can’t even buy them. That’s because it’s bound by a thing called the JADE Act , which was signed into law back in 2008 as a way to hit the ruling military junta in the country hard as a form of economic sanction. With Aung San Suu Kyi back in the picture, there is scope for these sanctions to be lifted – but to the best of our knowledge it remains in effect – and in that time China has risen as the biggest demand centre for rubies despite extra Myanmar rubies being available to that market as a result of the US not taking Myanmar rubies. It should also be noted that Myanmar has been supplying rubies to the world for literally centuries, and consequently according to GIA, the world’s foremost authority on diamonds, coloured stones, and pearls, the country’s supply is reported to be dwindling. The rise of the Chinese luxury market is nothing new, and has been a function of the rise of the country over the past five or so years. According to a report from Bain & Co, Chinese consumers make up roughly 30% of global luxury sales in a market that is worth more than 1 trillion euros ($A1.55 trillion). Again, the growth in ruby prices has happened in spite of increased demand from China over the journey and more rubies being available to that market from Myanmar. So, basically, there’s too much appetite for rubies for the current market to supply. Enter Mozambique, and the likes of Gemfields and MUS to the rescue. The piece above features rubies from Mozambique. Every Cartier creation begins with a stone. In this case, an elongated oval ruby from Mozambique weighing 15.29 carats. It is a jewel that seems to have a beating heart, resplendent in every aspect of its substance, its rich colour and its powerful, glittering fire. This is Cartier – the crème de la crème of luxury – and marketing talk! If Cartier is loving the rubies of Mozambique, then you can guess that the rest of the luxury market is starting to catch on too. Mozambique also has some unique advantages in the supply market with infrastructure already in place thanks to the recent graphite boom and the oil and gas sector on the coast. Ultimately, to make it to market, it’s going to take less time than other jurisdictions because most to all of the infrastructure is already in play. 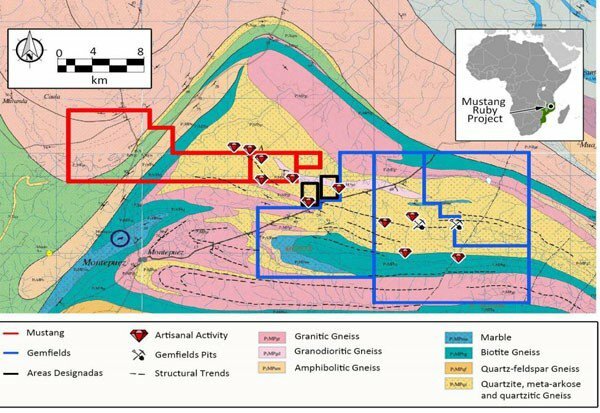 Before this point, MUS was one of the small players considering graphite as the go – as it was along strike from the likes of Syrah Resources (ASX:SYR) and Triton Minerals (ASX:TON). It has its foot on about 667 sq.km of graphite ground in Balama. MUS was operating on the assumption that this was its play until about six months ago – and the drilling it had done to that point backed up the sentiment. The results of some reverse circulation drilling done on the permits indicated that this could well be worth chasing. It had wide graphite zone interceptions from 1m including 67m, 64m, and 74m. Grades on 23 samples from the drilling came back at more than 15% total graphitic content – and sample analysis found that more than 50% of flakes in two key permits were super jumbo flakes. It had more than enough promising data to run headlong into the graphite game. But when your neighbour starts making money hand over fist from rubies next door before it even gets to mining, then you pay attention to that. It hasn’t given up on graphite though, or its diamond project to the south. More likely, the play is to fulfil the bare minimum permit conditions in terms of work program and keep it on ice until the sale of rubies makes its projects cashflow positive. With that, it can come back to the graphite plays and develop those and augment the ruby project. That’s our pure speculation though, and should not be treated as gospel. In fact, you should always do your own research before making any sort of investment. We love a company which is willing to change course to get a better deal for shareholders. This, unfortunately, can result in small cap companies trying to find the ‘buzziest’ commodity to play with so it can get shareholders excited, raise cash from them, and then pay themselves a salary. In the case of MUS though, it’s decided to take a punt in a sector which hasn’t caught on in retail investor circles – leaving one of the sectors generating buzz on the backburner. It’s done so because it’s recognised that as a small company, entering into a capital intensive business may not be the best bet no matter how many batteries Tesla may need. Instead, it’s identified its neighbour’s success and how it made cash before it started to ramp up. MUS is just about to hit the bulk sampling phase, where it will hopefully dig up the parcels it will need to prove a JORC resource, and therefore make some money instead of having to periodically tap shareholders for cash. It’s a smart way to go about it, and we’ll keep our eye on this one for the next few months at least.